OmiCronFX : Traders who think “What a pity…” really don’t get it. Traders who think “What a pity…” really don’t get it. The psychology of trading is on everyone's lips and discipline is the holy grail of the market participant, whatever market he or she is in. These things start off as concepts, as they must. However, far too often, they remain only concepts for the useful lifetime of the person concerned. This is a problem. They must be made to develop into motivators for decisive action and a real understanding of what it means to think in probabilities. One exercise that is worth pursuing in this regard is the one that requires that whenever traders find themselves thinking "what a pity…" for whatever reason, they take serious time out to examine the situation in light of the following. Nobody can foretell the future, and certainly not the future of the markets. All the profit retention, risk control, trade management and cash flow measures that the trader puts in place are there to cater for the fact that the only thing that makes a difference in trading is the ability to think in probabilities. 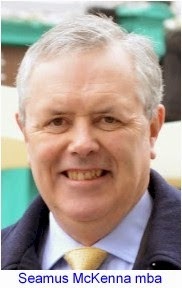 But if you are truly thinking in probabilities, then, by definition, no individual trade is of any consequence at all. At Omicron Forex, we only examine individual trades in order to get insights into what might be called trading anatomy, so that we can refine our strategy. 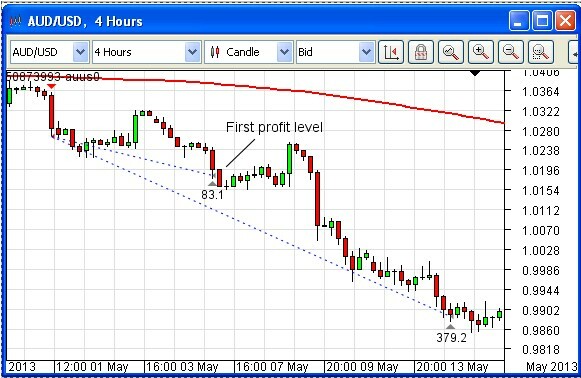 Here the trade went into reverse after the first profit level in each case. 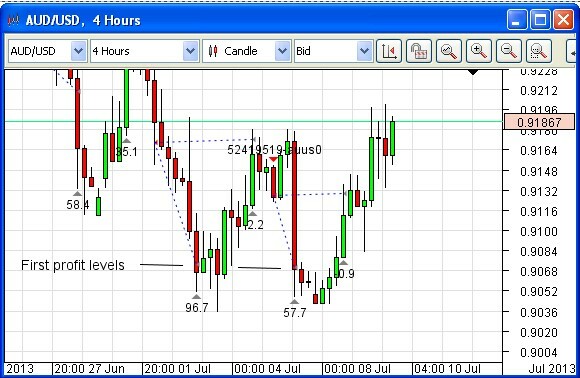 As usual they were under the control of the Omicron Forex Silver Trigger algorithmic trade management routine, which moves the stop loss to Break-Even when the first profit level is reached. Also in each case, the value of the account equity when the first profit was taken was somewhat more than it was after the trades went into reverse and were stopped out at Break- Even. There is no doubt that the trades would have been more profitable if the entire position was taken off at the first profit level. But that is hindsight talking, which is a totally futile exercise. But by far the most significant thing about this sequence is what it is telling us. It is signalling, loud and clear, that this pair is very likely about to go into reverse. And this is exactly what happened (see next chart, which illustrates a double bottom). So by making good use of our money management techniques we were able to get invaluable information at better than no cost - we made a little money at the same time. Living through such patterns is so much more valuable than just noticing them on the chart after the event. Here we have a nice example of where the first profit level is followed by a much greater further profit. Here, hindsight will tell us, the first profit level should not have been taken at all. In the long term, taking the first profit level and moving to break-even is the only way to go. It covers all the bases. It makes sure that in the event that a trade reverses thereafter, there will be some degree of profit from it. The price to be paid for this advantage is the foregoing of the degree of profit that would have resulted in leaving the whole trade in place when it does go in the required direction, as above. This is what probability does for us. The same goes for when an outright loss occurs. If we have done our homework, this loss will be well compensated for by the wins. The bottom line is, we cannot tell the future. But so long as you apply the proper principles over the long run you will, truly, not care what direction the price goes in. 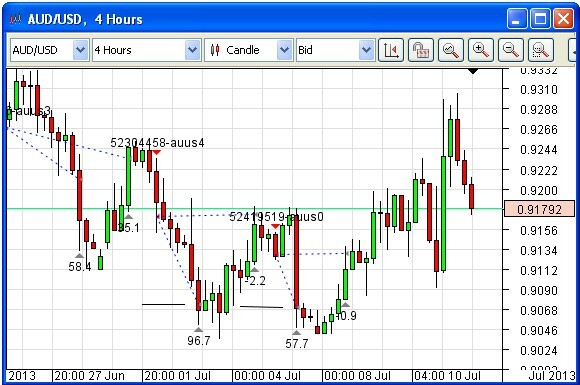 The feature described above is programmed, as an option that can be chosen by the user, into the Omicron Forex Silver Trigger routine.